Weight loss during the holidays? Really? How do I love the holidays? Let me count the ways. First there is the decorating... tinsel, ribbons, wreaths and beautiful ornaments. Then there is the crackling fireplace, festooned in evergreens with traditional stockings "hung with care". And my favorite part? The cooking, of course! Christmas cookies and candies, cinnamon buns, eggnog and spiced cider... the tastes, the smells, it really doesn't get much better! That is until about January 3. 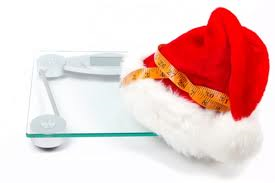 The merriment of the holiday season can be dimmed big time by the reality check of the bathroom scale. Weight gain from holiday gorging varies, and is as variable as there are body types -some people can go up a full dress size while others notice their jeans are a little tighter. Either way, there are tactics to spare yourself the after the holidays regret! 1-Burn More. You might want to consider adding a few more minutes to your cardio workout. Your body is smart and will step your metabolism up as a thank you, helping you become more efficient using calories. 2-Eat Less. No, I'm not talking radical diets here. Just being mindful to the fact that there will be more food everywhere I go and chances are, I will be trying some of it. Taking a little less food at mealtimes will help me out in the long run. 3-Just One. Let's face it: saying no to all the goodies out there is next to impossible. So I am giving myself permission to say yes to ONE (a small one, too). That doesn't mean one of each if there is a gi-normous spread in front of me! It means carefully choosing which goodie I am going to indulge in and then going for it, guilt-free. 4-Drink up. With water that is! When so much holiday cheer comes in a drinkable form, body clutter can creep on even if your eating habits haven't changed. Keeping in mind that almost everything that goes in your mouth counts, drinking lots of water instead of hot cocoa, spiced cider and mulled wine makes sense. 5-Don't Starve. That's right! A lot of people "save up" for a big holiday party, starving themselves so they can pig out at the buffet line. This is a big mistake and will undo all good intentions. Keeping your metabolism stoked (by eating several times a day) will help keep the body clutter at bay... even during holiday time! Of course, there is always more. But for this Dinner Diva, this list of Five is very doable and something I know I can do. And if I'm lucky, a little weight loss might occur, too! Our Losing it with Leanne Plan will keep you going in the right direction, really!